Amazon Fire 7 2017 review | What Hi-Fi? In a US Chamber of Commerce newsletter in 1977, T. Bert Lance (the Director of the Office of Management and Budget) popularised the phrase “If it ain’t broke, don’t fix it”. That’s the approach Amazon has taken towards its latest Fire 7 tablet, which replaces the one that came out two years ago. We quite liked the old one and, because Amazon’s made relatively few changes, we quite like the new one too. That said, there are a few new features in Amazon’s latest budget tablet worth talking about. The main one is Alexa, Amazon’s voice-operated smart assistant. Since starting in the Amazon Echo, it’s moved into streaming sticks, cars, cameras and even refrigerators – so it’s only natural it would find its way to tablets too. You can’t activate Alexa by just saying the wake word, as you can on the Echo, though; Amazon says this is to preserve battery life (which at eight hours is one hour more than the old Fire 7) and its designers think you’ll be close to the device when you want Alexa’s help anyway. So, instead of calling out to Alexa, you hold down the home button until a familiar blue light flashes across the bottom of the screen. If you haven’t used Alexa before, it has more or less the same qualities as Siri does on the iPhone or Google Assistant has on an Android phone: it can set timers, tell you the news and weather, and answer easily-Googleable questions. Those with compatible smart-home devices can also use Alexa to activate them – turning lights on and off or starting your smart-dishwasher, for example. But the lack of voice activation does make it a little slower to use (and less fun) than shouting to an Alexa-integrated speaker. But Alexa isn’t limited to the latest-generation of Fire tablets, so if you already have one (provided it was made after 2014) a quick software update will put it onto your current tablet. Speaking of software, the new Fire 7 runs the same version of the FireOS operating system that the old one does. As such, it has the same benefits and limitations. Based on Android, but lacking the Google Play store in favour of Amazon’s own services, its main focus is on Amazon Prime. Every tab on the homescreen is set for a different Prime service, including books, music, video, games and audiobooks. It’s a little irritating to have ads and special offers appear unbidden on your lock screen or on the ‘Recent’ tab, but you can pay an extra £10 to get rid of them if they become a real nuisance. Unfortunately FireOS on this tablet is noticeably slow – powered by a 1.3GHz quad-core processor and 1GB RAM – and sometimes it can take a second or two to load up apps. This is still not a tablet you want to use for dedicated gaming or intensive photo editing in the way you can on Apple’s iPads. Amazon has, however, tried to make the Fire 7 more reliable when streaming video or music through support for dual-band wi-fi. If your router puts out two different frequencies (2.4GHz and 5GHz), the tablet will be able to switch to the less congested frequency at any time – and that should mean you can continue watching or listening to content uninterrupted. For those that would rather have their media offline, the Fire 7 has 8GB of storage (or 16GB for £10 more) that can be expanded up to 256GB by a Micro SD card. 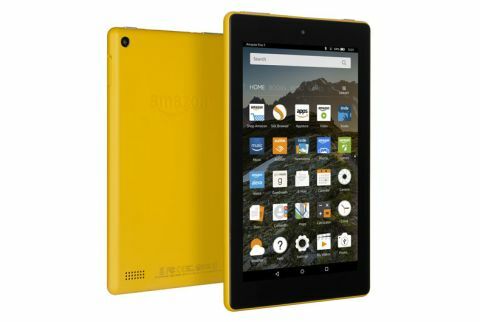 While the Fire 7’s screen might look like the old version, and has the same 1024 x 600 resolution, Amazon says that it has made improvements to how the tablet handles sharpness and contrast. But any positive changes made aren’t immediately visible, and putting the original tablet next to this one you’d have a tough time definitively saying which one looks more detailed. What is obvious is the change to the colour palette, which is definitely warmer now. Watching a stream of Stranger Things on Netflix, the skin tones are redder and look a little punchier than the somewhat washed-out picture of the original Fire 7. It was never going to be the last word when it comes to detail or contrast – Apple’s iPad leaps ahead of it in terms of dark detail and subtlety – but it’s perfectly watchable and those looking for a cheap tablet to entertain their children, who will probably be mostly watching brightly-coloured cartoons, will be satisfied with it. Books and web pages look pretty crisp too, so as a budget eReader (and a more multi-purpose alternative to some of Amazon’s own pricier Kindles) it’s a safe bet. Sound quality remains generally consistent between this generation and the last. It’s nicely balanced, keeping the treble, bass, and midrange in line, and there’s a suitable amount of detail to it – although not enough to want to use it as your main listening device. Much like the original Fire 7, it’s not a particularly sophisticated sound, lacking the rhythmic and dynamic skills necessary to capture a song’s excitement over headphones. Playing Golden Earring’s Radar Love through Tidal, there isn’t a sense of the upbeat pop and momentum that’s in the track, although at this price we don’t expect the world. Its tinny speakers are best avoided, having hard edges at high volumes and a closed-in midrange. If you’ve got a good Bluetooth speaker that you can pair this tablet with, we’d recommend doing that. Amateur photographers will shy away from the Fire 7’s 2MP main camera; images come out soft and lacking in detail compared with those taken with one of Apple’s iPads. The selfie camera is cut from the same cloth, but with more obvious grain. We’d be surprised if anyone decides to use it either to take their next profile picture or holiday snap. Despite its flaws, there’s little to really dislike about the Fire 7. It’s cheap, cheerful, easy to use and has a lot of the functionality of its more costly counterparts. Amazon Prime subscribers will also enjoy the dedication to its services, and its rare to see a product so efficiently designed. For those a bit strapped for cash, looking for a versatile smart-home controller, or just something to keep their kids amused, the Fire 7 will more than meet their needs.